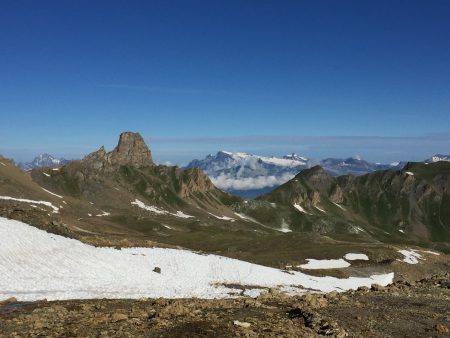 The Val d’Hérens is a valley full of living traditions, high alpine pastures and even higher mountains. A five day hike around it is a perfect way to experience what the valley has to offer, whilst providing constantly changing scenery. There is plenty of wildlife to see too, deer, chamois and marmots are not too difficult to see, as are birds of prey and many forest birds. There are a multitude of flowers and butterflies even at the highest elevations. Sounds abound too – principally that of running water from fast flowing streams, as well as cow bells and the shrieks of marmots. 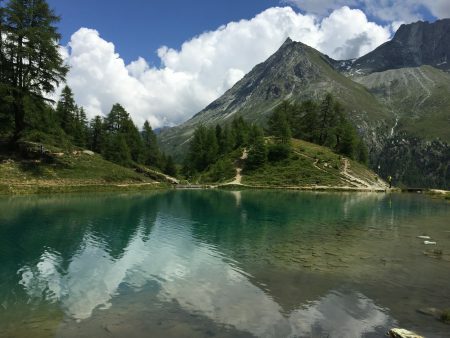 There are various ways to organize the trip – carry everything yourself for the true hiking experience, or let the Val d’Hérens Tourism Office arrange everything for you – booking hotels and transferring your bag every day so you just carry a day sack. There is an official route, but there are plenty of options to take different paths according to interests, the weather and different fitness levels. Here are details and experiences from a five day trip made in July 2016. We set off from Sion station, taking the 09.10 postbus up to Veysonnaz where we then took the télépherique up to Thyon2000. The path starts right in front of the cable car station and soon leads you away from the ski area and into open mountains. Across the valley we could see Nax, our destination in five days time. 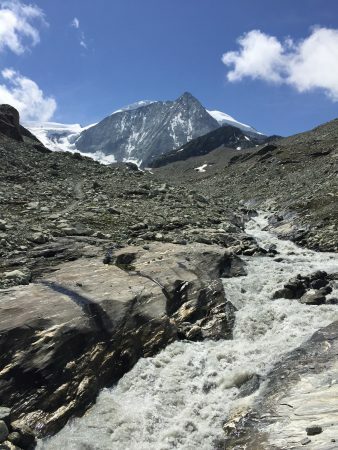 One option upon leaving Thyon2000 is to follow the ridge as far as Mont Rouge which affords good views in all directions, though we elected to stay lower down and reserve our legs for the hike up to the Grande Dixence dam. We still had great views of the Becs de Bosson, La Maja, the Weisshorn and down into the valley below. The path passes by raised bogs, herds of Val d’Hérens cows and the Cabane d’Essertse (which could be an option to stay over at if you start the walk in the afternoon). The dam wall soon comes into view, but quickly lulls you into a false sense of security – the Grande Dixence is the largest gravity dam in the world and its a long traverse around the slope to reach it. The dam doesn’t seem to get any nearer! The path takes you to the top of the dam, whilst the hotel is at the base of the dam wall. It’s possible to take the cable car down. The map indicates a path that would take you to the hotel without having to climb up to the top of the dam but we missed seeing it. 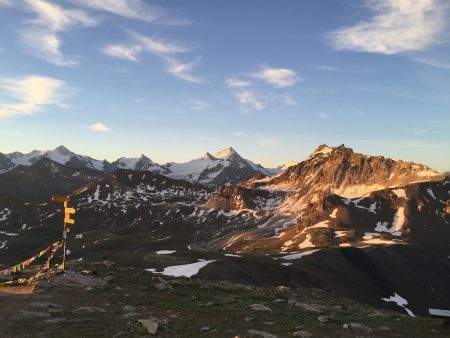 One other option for those that are fit is to climb up to the Cabane de Prafleuri to stay the night. We opted for the hotel where there was a warm welcome, an excellent three course meal (as part of a demi-pension option) and great views back down the valley. Once the day tourists have departed the hotel is quiet, but we were glad of an early night. We had a leisurely start, taking the first cable car ride of the day at 9.35am to the top of the dam wall. 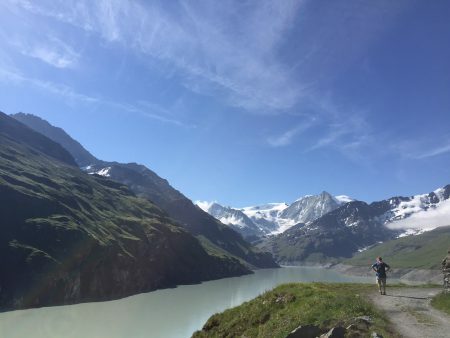 This was followed by an easy walk to the end of the dam with fantastic views of Mont Blanc de Cheilon, La Sâle and the Aiguilles Rouges d’Arolla. There were plenty of marmots scampering around and the almost obligatory herd of Val d’Hérens cows, with their bells audible from afar. At the end of the lake the path heads up to the Cabane de Dix. The map shows the path crossing over the river quite soon after the end of the dam, but this is now not marked on the ground. Follow the well marked trail and as the path starts to climb the glacial moraine the route to the Col de Riedmatten and Pas de Chèvres branches off and is well signposted. It crosses the stream at a new bridge. This is the only disparity we found on the trip between the map and the signposting on the ground. If in doubt follow the good signs on the ground! By now the route is into some wild country traveling through glaciated terrain, with spectacular views all around, and occasional flowers clinging on in surprising places. The geography is still evolving as the glacier retreats and rivers carry silt downstream. There was the constant sound of rock and icefalls reverberating around us, though we never managed to see them. Close to the Col de Riedmatten the route gets a little more difficult as a landslide has carried away the previously route, and the new one is not yet well established. There are two options now, the Col de Riedmatten itself, or the Pas de Chévres. The route up to the Col de Riedmatten is quite steep and there are chains near the top which makes progress easier. 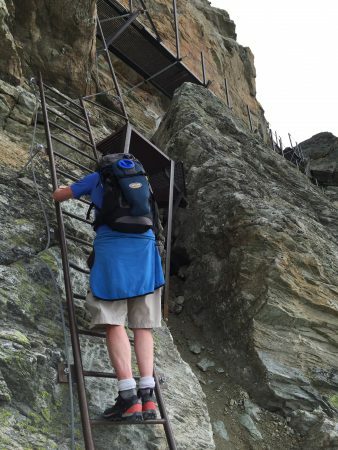 The Pas de Chévres has an easier entry, though ends with a series of ladders up a rock face. These are new ladders erected in 2014 in four sections (15-20 steps each) with platforms in between to gather your breath. They have replaced the previous rather scary ones, and should be scalable by most with a reasonable head for heights (if in doubt, don’t look down, don’t look up, and you’ll soon find yourself at the top!). We took the ladder route. 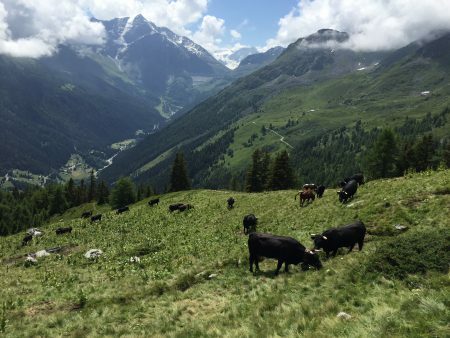 From there its a gradual descent past ski slopes, more cows and then pine and larch trees to Arolla. 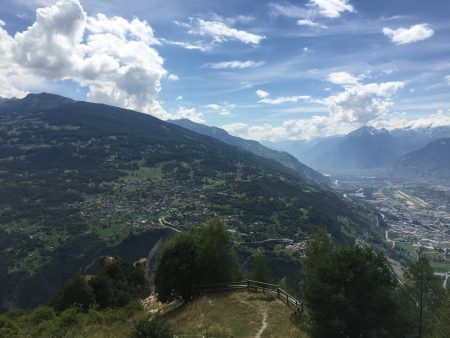 Just outside Arolla there is a buvette which is a good place for a drink, an apricot tart, and a moment to contemplate the view. The smell of the forests makes a contrast from the rocky vistas of just 90 minutes previously. There are various accommodation options in Arolla. 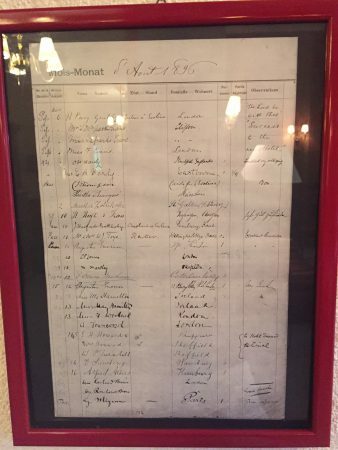 We chose the Kurhaus, one of the historic hotels of Switzerland – all wood, geraniums and memorabilia from its early days – it opened in 1896 and the walls have framed guest lists and accounts that make fascinating reading. The rooms are very comfortable, there are deer in the surrounding forest and warnings not to leave food on the balcony as the squirrels can take off with it. We had an excellent four course dinner (half board option) and that evening there was a concert with works by Kreisler, Beethoven, Schubert, Brahms and Debussy. All very civilized. The destination for day three can vary – either being Les Haudéres, Evolène or La Sage, though most people seem to favour Les Haudéres. There are two main options down to Les Haudéres, following the river, or along the contour to the Lac Bleu (though quite a taxing up and down route). 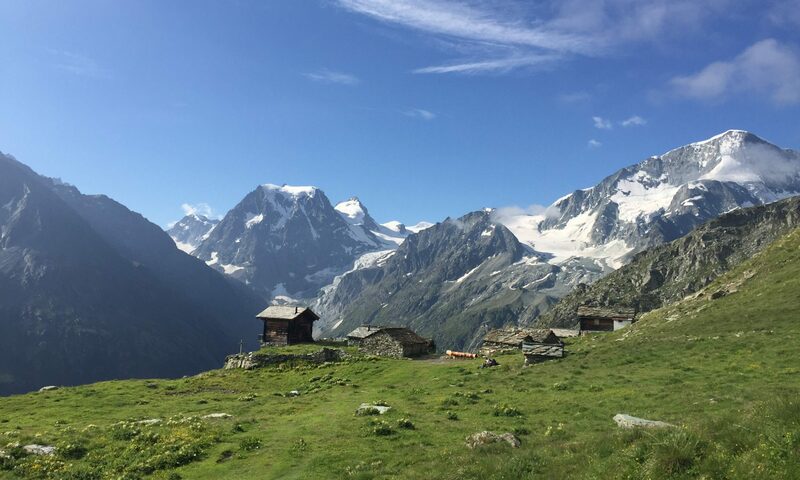 After a splendid breakfast looking over the lawn and onto Mont Collon, we took a third route – electing to hike up to the Cabane des Aiguilles Rouges at 2810m before descending to the Lac Bleu. This afforded us spectacular views all around to Mont Collon, the Pigne d’Arolla, Les Aiguilles Rouges d’Arolla (from the other side from yesterday), the Dent de Perroc and the Aiguille de la Tsa. Looking down there were views to a spectacular waterfall and the Lac Bleu nestled in forests in the valley. The hut is easily reached in three hours (including some stops to admire the views) and we had a cup of tea and homemade cake. This could be a good place for an early lunch, though we made the steep descent to the Lac Bleu. This is a great place to take off your boots and revitalize your feet in the ice cold water. A few hardy folks were swimming. Then it was down through the trees to La Gouille. After the hike up to and down from the Cabane, the bus to Les Haudéres is an option, but the walk to Les Haudéres is a pleasant one which goes through larch and spruce forests and then alder and birch before reaching the first village and our first taste of “civilization” since leaving Veysonnaz (the Kurhaus is above Arolla and we did not venture into the village there). We stayed at the Hôtel Les Mélèzes, a very nice hotel with the most spectacular collection of flowers on the balconies. Again we had a very tasty four course meal (it should have been five courses but we were already full…). An extensive breakfast with a great expresso set us up for the day. 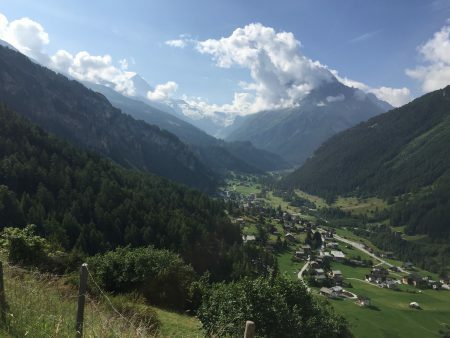 We took the bus to Evolène to save a few kilometres as the day was a big one – 1600m uphill. 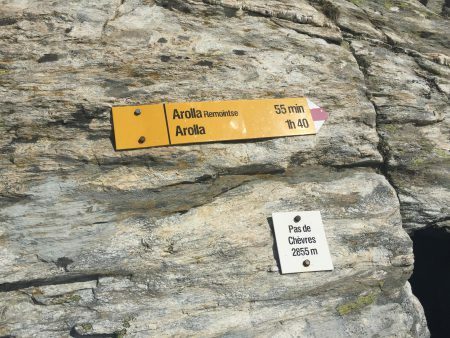 A couple staying at the same hotel and also doing the Val d’Hérens Tour got the hotel taxi to take them upto Fourcla which gave them a head start of 400m of climbing. We wandered through the village of Evolène and up through the pastures and forests with the view opening out behind us, to show the Dent Blanche (the Val d’Hérens’ iconic mountain) and the Ferpecle glacier. Farmers were in the fields gathering hay in, by hand. We then had an hour or so climbing gently through larch and spruce forests before emerging into pastures and eventually a buvette at L’A Vieille. This was a very popular place with a “plat du jour” and a long list of deserts which we sampled, to the accompaniment of cow bells. We had to navigate the herd of cows and then it was onwards to the Pas de Lona. This is part of Verbier to Grimentz cycle race and we were overtaken by several cyclists in training for the main event – they breezed past us, carrying their bikes. A family came running past us, presumably in training for a fell race. Finally we were at the Cabane des Becs de Bosson and had a well earned rest. That evening there was a family atmosphere with parents and young children having also made the trip. There was a thunder storm and we were treated to a fantastic double rainbow. 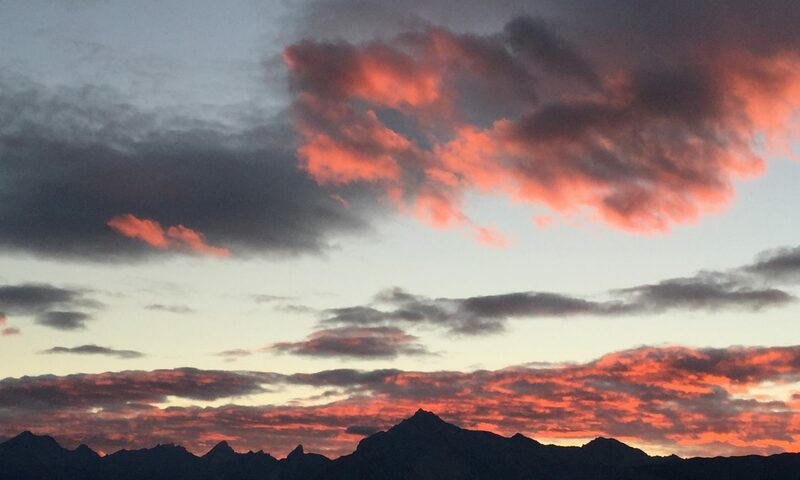 Up early to watch the sunrise come up and light up the 4000m peaks that are visible from the hut – the Bishorn, Weisshorn, Zinalrothorn, Ober Gaberlhorn, Dent Blanche, the Dent d’Hérens and Mont Blanc. Spectacular! We then climbed the Becs de Bosson (getting close to the top before the going got a bit scary) and back in time for breakfast. Then it was time to set off down to Nax, through the Val de Rechy, a nature reserve with unique (for Switzerland) habitats. There was still a lot of snow on the first part of the way down so the walking poles came in handy. Reaching the Col du Cou in good time we went “off piste”, climbing Mont Noble where we had lunch with a great view of the Rhone Valley, the Weisshorn in one direction and Mont Blanc in the other. Then it was a long way down past more alpages (with Val d’Hérens cows) and through forests until we reached Nax. Across the valley we could see Thyon2000 and Veysonnaz where we had begun the trip. It was time for a beer. The recommended map is Val d’Anniviers & Val d’Hérens Map 23 by Kümmerly+Frey. With this you can add variants to the tour by taking slightly different routes according to the weather, fitness levels and interests. Strong hiking boots are best though hiking shoes are also possible. Hotels and the Cabanes can provide packed lunches. There are supermarkets in Les Haudéres and Evolène. Take plenty of water and sun cream.